State and local officials are conducting new tests to check the spread of the 1,4-dioxane plume in groundwater in Ann Arbor's West Park area. Dan Hamel is with the Department of Environmental Quality. He says a current consent agreement between the DEQ and the company requires Gelman Sciences to prevent the spread of the suspected carcinogen. Hamel says the chemical plume originated from the former manufacturing plant. “Right now they are currently, actively remediating the groundwater plume,” he said. Hamel says the company uses a process called pump-and-treat to clean up contaminated water. Officials said the chemical compound was first detected in Ann Arbor’s West Park area in December of 2017. “We have not determined yet whether it is related to contaminated groundwater associated with the Gelman plume,” Hamel said. Water samples from seven Allen Creek storm drain locations were collected this week for lab analysis. Hamel said the tests will be repeated once a month for six months. Over the years, a number of homes were taken off well water after detectable levels of the chemical compound were found. The 1,4-dioxane plume has been slowly spreading from the site of the former manufacturing plant since the 1980s. It now covers an area more than three miles long and a mile wide. The Ann Arbor City Council has approved spending an additional $100,000 for attorney fees in the state of Michigan's lawsuit against Gelman Sciences. The city has hired attorneys from Bodman PLC to help negotiate a settlement with the group, which is responsible for polluting Ann Arbor's groundwater with the hazardous chemical 1,4-dioxane. 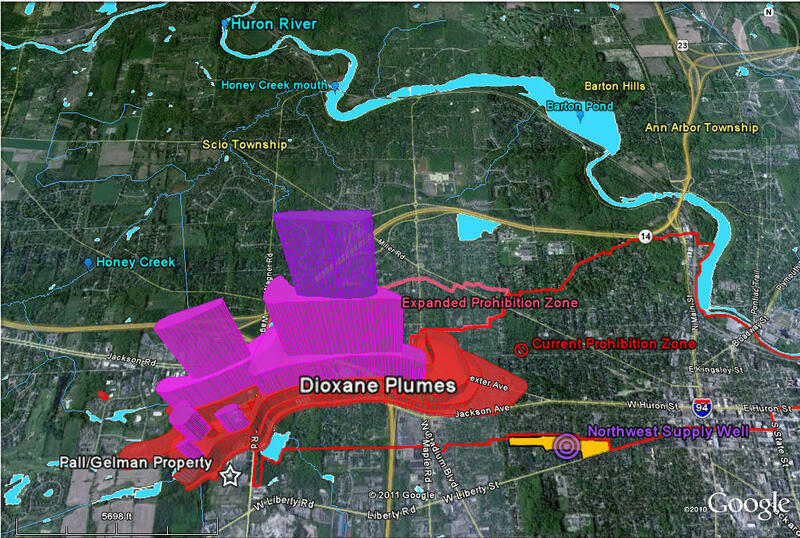 The U.S. Environmental Protection Agency says it will begin an examination into the Gelman 1,4-dioxane plume spreading through the groundwater of Ann Arbor and Scio Township. The EPA will determine if the pollution qualifies for federal Superfund cleanup. Yesterday, Scio Township, which borders Ann Arbor to the west, joined the existing lawsuit against the polluter as a plaintiff. Scio Township joins the city of Ann Arbor, Washtenaw County and the Huron Valley Watershed Council in the lawsuit. President Donald Trump's proposed budget calls for cutting money for cleaning up Superfund sites by a third. But the EPA's new head, Scott Pruitt, has told employees that he's going to make Superfund cleanups a priority. Activists fighting for the cleanup of a Superfund site along the Pine River in St. Louis, Michigan hope Pruitt will get some more money so he can keep the promise. It's one of the most polluted Superfund sites in the state.